Leisure time was on the rise by the late nineteenth century, resulting in an increased interest in gardening, conservation, and spending time out-of-doors. 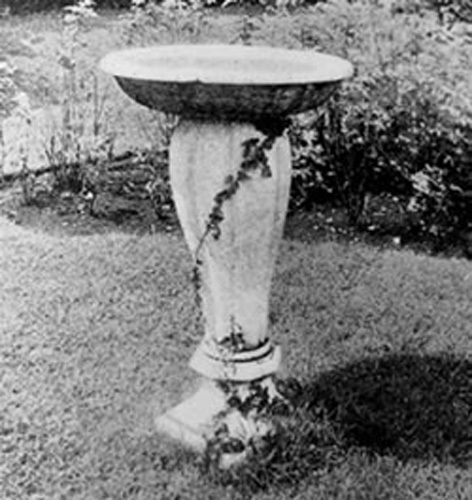 The economic gains that made this possible were fueled by the industrial revolution, which saw eager manufacturers responding to expanding markets that included garden amenities such as the birdbaths that are now desirable antiques.Property owners with modest budgets gravitated to the new mass-produced birdbaths. Small in scale with classically formed bowls elegantly mounted on columnlike pedestals or placed near the ground, they fit attractively into almost any garden space Available, affordable, appropriate, and tasteful, they satisfied the needs of an upwardly mobile America. 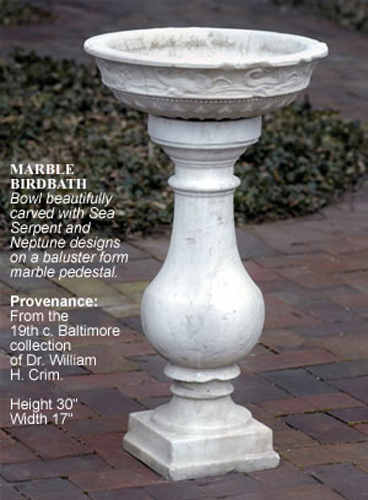 The earliest designs of manufactured birdbaths were borrowed from antique Italian ornaments. With the turn of the century, the market expanded, and so did the decorative range. Cast or carved in a variety of materials, figural elements of cherubic children, putti, birds, frogs, turtles , and squirrels, as well as floral motifs and rusticated tree branches were combined with bowls and bases for an endless variety of products. 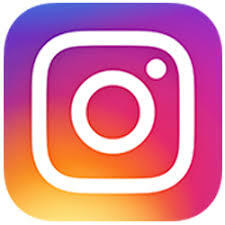 Birdbaths were most commonly cast from artificial or composition stone, a concrete made from water, Portland cement, sand, and stone of various minerals in particle or dust form. Few birdbaths identify a production date and origin of manufacture, so determining this information can be difficult. Antiques dealer Aileen Minor notes that some of the older companies still in operation continue to produce castings from original molds, though they use contemporary techniques, such as welding instead of bolting together metal components, and use glazes that no longer contain lead. Those attempting to pass off new birdbaths as antiques often accomplish this by taking castings of original examples, though this process generally results in shrinkage and a less delineated cast impression. Reproductions also often show the residues of casting, such as rough or sharp edges, that would have been burnished off originals. 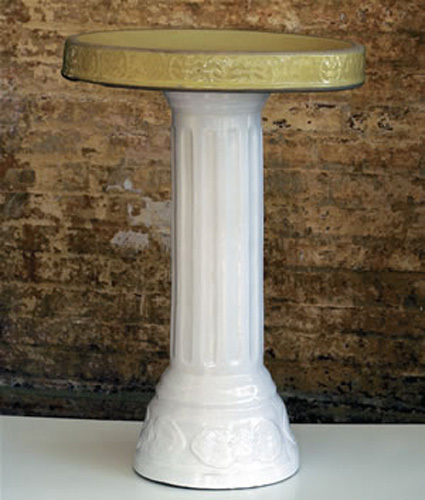 Antique birdbaths will show wear and patina from years of exposure to the elements. 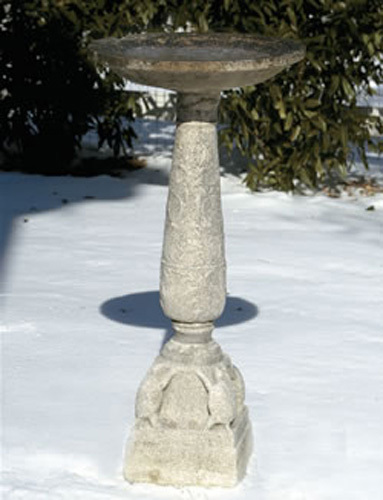 Exposed surfaces of old cast stone may darken in color from weathering or retain evidence of mineral residue from constant contact with water: verify with the dealer whether the birdbath's material will withstand freezing and thawing. If considering a two-part birdbath, try to determine if the pieces are original to each other or "married," and decide how important that is to its look and function. 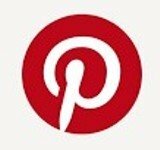 If only the bowl survives, place it on a pedestal or on a platform on the ground, which can be covered with a decorative vine. The bowl must not rest directly on the earth. Additional antique birdbaths from our garden antiques. Natural materials including marble, granite, Indiana limestone, and sandstone, were handsomely carved into the most expensive examples. Artists employed by American art potteries turned their skills to creating glazed terra cotta birdbaths for new garden ware lines, expanding buyers’ options by introducing elements of color. Birdbaths were also cast from various metals: iron, lead, bronze, and aluminum, among them. The venerable J. W. Fiske Iron Works of New York City was among the firms to follow experts’ recommendations for attracting birds through the sound of running water and offered iron bird fountains, finished in either a bronzed or painted finish. When selecting a birdbath, safety and security are important. The rim should be comfortable for perching birds—not too sharp nor too slippery for secure footing—with gently sloping sides. The bowl should also be shallow enough for the birds to stand and bathe in. Bowls of two-part birdbaths should be mounted securely on their bases. Not only could an unstable part fall and be damaged, it could also result in injury to a bystander. Placed on a lawn, tucked into shrubbery, or featured as a focal point in a bed of flowers, antique birdbaths are attractive visual ornaments that bring beauty and song to a garden. Kathryn Meehan is a garden historian and former assistant chief of horticulture at the Smithsonian Institution, Washington, D.C.